I experience weakness due to anemia. I am always tired, and have shortness of breath, headache, joint pain, and heart racing. After two years of testing to find the cause for my anemia, I had a bone marrow biopsy and found myelodysplasia due to a mutated gene in bone marrow. Brain fog is putting it lightly. I have cognitive difficulties and mental decline, hair loss, exhaustion, constantly cold hands and feet, night sweats, no appetite, bone pain, muscle pain, insomnia, and shortness of breath. I had/have every awful anemia symptom with the exception of Pica. My hematologist said his patients with Pica would mostly chew ice (I am so cold from this that I can't imagine eating ice) and some even ate dirt, or at least had cravings for non-food substances. I don't get Pica and can barely eat a meal at all when I'm anemic. The worst for me is the mental fog/cognitive problems that make me forget things, lose track of time, etc., and the shortness of breath (air hunger) is scary. Most women would be flipping out at this hair loss, but anemia also brings with it sluggish apathy and a sense of malaise. I don't want to just look normal, I want to be better. Not sure if I am anemic. My levels are low but not dangerously low. These were my results on 6-24-17: RBC 4.14 (4.2 - 5.8), hemoglobin 12.4 (13.2 - 17.1), and hematocrit 36.8 (38.5 - 50%). Today is 1-21-18 and I feel my energy levels deteriorated by over 50 percent. Sometimes I feel my hands are too heavy for my shoulders to carry, or I'm wearing a heavy jacket! My body is beginning to fight every good food I once ate like apples, cherries, persimmon, and peaches. I decided to eat a few pickled slices of jalapenos and a half hour later I had boils filled with pus, in my mouth. When it got cold during end December and early January 2018, my fingers turned white inside my gloves in the cold. I easily pull a muscle in my lower back, and I'm always shivering. My eyes are so dry, they get sealed in the morning and if I move my eyeballs inside, I'll be crying in pain. I've learnt to rub the corners of my eye and let the drops seep before opening. I wonder if this is the real anemia, could my results have gone so bad in six months! Or perhaps this is some autoimmune disease. During the last 3 months 3 blood tests taken have shown a drop in my hemoglobin from 11.7 to 10.8, an almost full one point drop. I am 77 years of age and not particularly fatigued much but have short periods of time when exercising when I feel the need to rest between activities and occasionally feel my heart racing a bit. Otherwise I feel fine and am able to function without any undue need to rest. When I was young and growing fast I was anemic but this appeared to go away when I reached adulthood. I got so tired and breathless I had to push myself along to take a few steps. I thought it was that my COPD (chronic obstructive pulmonary disease) had gotten a lot worse real fast. My respiratory therapist told me my face color was strange so I went to the doctor. She took a CBC (complete blood count) and called me that night and told me to go to emergency. 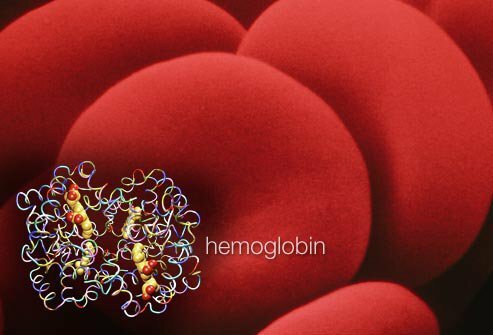 My hemoglobin was 5. I was in the hospital 2 days, got 3 transfusions and an endoscopy that showed that I had 2 small bleeds in my stomach and she clipped them. When I left the hospital my hemoglobin was 8.5 and now 2 weeks later it is 9 so I am recovering from the anemia. My anemia symptoms are blood in stool, dizziness, and stomach ache. I just found out a few days ago that I am dangerously anemic. I had a stress test done because I was having painful heart palpitations and shortness of breath. Doctor told me I was fine. That was at least a year ago. Now I feel tired, though I have slept well. I also have shortness of breath, which I blamed on gaining weight. I've had anemia for several years. I haven't had it checked, lately, but I know my iron is low because I feel dizzy, short-winded and my heart feels like it is racing. When I stand up, I literally see stars. My hemoglobin was 6.2 a few, weeks ago. I had to be hospitalized and have a blood transfusion. They had to give me 3 bags of blood to raise my hemoglobin to 8.1. I was in the hospital 2 nights. I had a colonoscopy and an upper endoscopy. They found nothing to explain my drop in hemoglobin. Next I am having a procedure where I swallow a capsule with a camera in it. I hope they figure out what"s causing the anemia. I"m still tired, get short of breath, crave ice, and my hair has been shedding worse than normal. I have been feeling bad for months, probably years, but it's been really bad for a few months. My symptoms have included extreme dizziness, not able to concentrate, extreme thirst, fatigue, headaches, irritability, insomnia, etc. I went to try and donate blood recently and they told me I had an extremely low hemoglobin count, 9. I then immediately googled symptoms of anemia/iron deficiency and voila! All of my symptoms explained. I've started iron supplements and will have my iron checked again in a month. I feel so relieved that it's not something more serious, but also frustrated with myself that I didn't figure this out sooner! With anemia, I experience headache, tiredness, soreness, and weakness. It has been a couple of months that I have been feeling that I was running a low grade fever, was very weak and tired, I was always suffering from a headache and I felt very irritable. I went to my doctor and he told me it was stress. It wasn't until I asked him to refer me to a dermatologist, because I had been noticing a lot of hair loss and tiny red dots on my skin, that I was told that my count was 7. It has been two and a half months now and I have been taking Palafer (and iron supplement) with orange juice (Vitamin C helps absorption of iron) and I still don't feel my usual self. I still have the weakness and dizziness and my hair won't stop shedding which is now a big concern for me. I saw my Dr.2 months ago- my primary complaint was dizziness. She sent me to an ENT and to see my ophthalmologist - all results were fine. I had also complained of headaches, palpitations and incredible fatigue. (If I do not set an alarm I will sleep for 12 hours and then drag myself around) She never checked my blood. Two months later, still suffering all of the above symptoms plus an incredible craving for ice, dry mouth and a tongue that felt like sandpaper( I had also lost 8 pounds) I went for a routine CBC related to upcoming outpatient surgery (unrelated)they discovered a Hgb of 9.2. No wonder I didn't feel well. I have anemia and one of my symptoms is I'm always cold with chills. I have had chronic anemia for 4 years now. I had two blood transfusions and 3 colonoscopies. The doctors said I have an iron deficiency, but they can't figure out why. I get iron infusions because I can't absorb iron orally. I have been down to a 4.6 HBC, used all the iron stores in my liver. I have a new doctor now since I moved, waiting to see how long till I need my next boosts, it's been going 5 months since my last infusion. Iron levels were starting to drop between blood draws one and a half months apart. Here we go again! 2 months ago my mother told me that I look pale. But, I don't mind it I just put in mind that i was just a joke. The next day when I am washing my clothes I get easily tired and my hands looked pale and cold also I feel dizzy. My mother told me that I'm anemic because of the symptom's that I usually encounter. That is why everyday I will drink sebukaw a herbal medicine that is used for the local persons to prevent it. Started Proferrin 2 weeks ago, Had my ferritin done before and after taking for 2 weeks and ferritin still 9. However am afraid to continue as my front bridge and lower teeth are discoloring. Is this a side effect not mentioned. I feel very tired every day, even when I have gotten a good amount of sleep. I also feel pins and needles in my hands and feet every now and then. My mom and my maternal grandfather are both Anemic, so I think I may be as well. I'm constantly feeling tired always feeling lightheaded and have a habit of fainting i'm in my young teens and I've been to the docs and they're sending me for a blood test. One of my teachers says that I might be anemic; I also have heavy menstrual and she says that it sounds like a typical faint. Due to some heart problems, I had two CBCs three days apart, which showed a drop in my hemoglobin from 12 to 9.8. The doctor requested it be tested again in 48 hours by the same lab. It was checked again 72 hours later with a result of 9.5. My doctor seems at a loss as to why it has jumped around so much in little more than a week. I've had anemia all my life, and for different reasons. I had bariatric surgery in 1984. Since the surgery I am unable to store B-12 or B-6.I also have thallesemia minor. After trying to treat my anemia with B-12 shots and iron pills for years, my primary sent me to a hematolgist. At that time my RBC was 7-8. I had four infusions of iron, and was told I did not have to have any more infusions for 2 -3 years. But all the symptoms are back. I have shortness of breath, spots in eyes every day; fatigue, etc. I'm always tired, dizzy, shakey, see spots in my eyes, am unable to concentrate, and some nights have terrible insomnia. Other nights I can't get enough sleep and have headaches, and faint feeling. These are to say the least. I had probably been living with anemia for years without knowing it. I was always cold, but otherwise felt OK. I would get fatigued, but I thought it was just hormonal and I needed to be more active, so I'd run a few blocks during my lunch break. Nothing seemed to help. Sometimes I'd get up at night to go to the bathroom and get so dizzy, I'd have to lie down on the floor for a few minutes before crawling back into bed. I attributed it to low blood pressure and premenopausal symptoms. I put myself on a high nutritional diet, took more B vitamins, and watched the carbs and exercised more. I was actually feeling quite good and energetic when I went in to have blood work done prior to having a piece of glass surgically removed from my foot. It was at that time the doctor announced my blood count was at 8 and I had low blood calcium levels -- and this was months after I came back to feeling "dandy" after increasing vitamin B and iron intake. I wonder how low it must have gotten. Scary. I figured that I must be anemic because of how easily I bruise, but I did not realize all of the other symptoms. I have extreme headaches nearly everyday, my pulse is usually 120 beats per minute, always in need of a drink yet nothing quenches my thirst, constantly dragging myself around because I am too worn out. I had no idea that these things could all be tied to anemia. I'll be going to my doctor this week to get a correct diagnosis. I felt as though I was wearing cement boots, just to walk into work from the parking lot took all of my energy and my heart would pound. I craved ice constantly, had horrible headaches, and dizziness, and just felt completely wiped out. I have had anemia since I was a child, I am usually tired, no energy, cold, headaches, sore tongue, and dizzy on bad days. I am giving B12 shots every three weeks. The B12 helps a bit. I have always been this way but I still do everything a normal/healthy person would do. I learned to rest when I had to and push myself to keep going. I have been on iron pills, these don't help. I am anemic from taking too much Motrin before and after knee surgery. My ankles and wrists and hands are very swollen. I am very weak and can't hike or do physical activities the way I used to. My doctor has me on 2 slow fe iron pills twice a day for 3 mos. My thinking is slowly getting better and my nutritionist has me taking electrolytes every day to reduce the swelling in my ankles. This experience has been very painful and I can't wait to get my strength back. I'm very sleepy all the time, and I'm cold all the time, even in the summer heat. I was/am eating four bags of ice per week, and I have dizziness. I was pretty athletic (jogging three times a week), and in the last few months, I had no desire or energy to even walk a mile or grocery shop. I sleep two times a day in two-to-three hour increments, and I am even going to bed at 9 p.m. besides that. I thought at first it was depression, but they drew blood tests on me last week, and I was diagnosed with anemia. I experience a tingling sensation in my hands and feet (felt like they were asleep)...was told, after blood work done, and was told I was anemic, that this was a possible symptom...I was not aware previous to this. I had shortness of breath, weakness, no energy. Unable to do simple chores, unable to walk any distance. I had insomnia, restless leg syndrome, urge to chew ice cubes, dizziness/vertigo. I have been taking 2 Slow Fe pills per day (under doctor's care) and all symptoms gone in less than 2 weeks. My symptoms are ongoing, and I am undergoing iron supplement treatment at this time. I feel tired, sleepy and drained all the time. I have dizzy spells that, at times, make me feel that I am going to pass out. I keep a mild headache most of the time. I have a loss of energy, and I always feel cold even when others complain that they are warm or even hot. No appetite. Bruise easily and my joints tend to stiffen and sometimes swell. My hand, fingers go numb while I'm sleeping. Now I don't know if all these symptoms are related to my being anemic for the doctors are still trying to help find the right treatment for me. They tell me I am very anemic yet have too much iron in my blood, so it's not an easy 1-2-3 take some iron pills and call me in the morning. Tired all of the time, no motivation, short of breath, headaches & dizziness. I was tired all of the time. I felt like I had to take a daily nap in order to survive. I also was having heart palpitations every day even while resting. I felt very tired, and tired in my movements. I would describe it as being tired down to my bones. It was almost as if I was going to get the flu but I never did. I also felt light headed and I couldn't take a deep breath. I have had anemia for some time now. The pills of any kind didn't help. I'm about to start the B12 shots, and from what I've read, it help but, the experience is not a good one. My experience includes eating ice all day and night, having headaches on a daily basis and being very tired. I can't get enough of sleep. I've tried a B12 shot and iron pills, but nothing seems to work for me. I was diagnosed with anemia in a routine blood test about 10 days ago. My levels were slightly below the lower end of the scale. My doctor told me not to worry and to take iron supplements. A few days later, I was exercising (core not cardio), and I became really hot and dizzy with blurred vision. I didn't improve for about 35 minutes so I laid down and the paramedics were called. I was anxious with heart palpitations, mild tremors in hands and legs and my Raynaud's appeared in my hands. However, in subsequent days, including today, I feel mostly well but every now and then I experience malaise and difficulty focusing. I had more blood tests, which were fine. I was feeling tired so my doctor ordered blood tests. As a result, the nurse noticed that my blood flow was very slow. They had to use three bottles to get enough blood to diagnose me. When I read the above symptoms for anemia, they described me to a “T.” I often feel as if I cannot make it through a day. I am so exhausted and weak. What's worse, my hair is subtly falling out. I get the palpitations that have been mentioned, along with a sort of racing of the heart. Okay, I've said enough here. Right now, I need a nap...again.